Spiranthes diluvialis (Ute ladies'-tresses) is known from only a handful of occurrences in southwest and south-central Montana in the Missouri, Jefferson, Beaverhead, Ruby and Madison River drainages. S. diluvialis is restricted in area by specific hydrologic requirements. Many populations have less than 100 individuals, though a couple have over 500 plants. Sites are susceptible to hydrologic changes and weed invasion. Large areas of habitat have been converted to agricultural uses. Livestock grazing is also a common use of these habitats. Two populations occur along highway right-of-ways. Most populations occur on private lands and only one occurrence is currently provided some potential protection or management for its conservation value. CommentGlobal distribution consists of several discontiguous areas. Score1-2 - Low to Moderate. Occurs in 4-25 Subwatersheds (6th Code HUC’s), though the species' distribution is not sufficiently documented to place it within one class. CommentOccurred historically in over 10 subwatersheds, but it is unclear if a few of the sites are still extant. CommentThough actual trends are unknown, much suitable habitat has been lost or degraded. CommentInvasive weeds, hydrologic alterations, development and agricultural conversion are the primary threats. Much of its floodplain habitat remains threatened by one or more of these threats. Score 13 to 16 total points scored out of a possible 19. Ute ladies'-tresses is a perennial orchid with usually 1 stem that is 20-50 cm tall and arising from tuberously thickened roots. Its narrow leaves are 1 cm wide, can reach 28 cm long, are longest at their base, and persist during flowering. The inflorescence consists of few to many white or ivory flowers clustered in a spike of 3-rank spirals at the top of the stem. The sepals and petals are ascending or perpendicular to the stem. The lateral sepals often spread abruptly from the base of the flower, and sepals are free or only slightly connate at the base. The lip petal is somewhat constricted at the median. Flowering in August-early September. Species is often not in full flower until mid-August. S. diluvialis is intermediate between its putative progenitors, S. romanzoffiana and S. magnicarporum; the latter is not known from Montana. S. diluvialis is distinguished from S. romanzoffiana by its whitish, stout, ringent (gaping at the mouth) flowers, by its lip petal being exposed in lateral view, and by its sepals being free or connate at the base for a short distance rather than fused to form a hood above the lip. Additionally, the 2 species occupy different habitats, S. romanzoffiana almost always in mesic montane and subalpine settings, only rarely occuring in lower valley locations, whereas, S. diluvialis occurs in alkaline wetlands in the valley bottoms. Spiranthes diluvialis occurs in four general areas of the interior western United States where it is sparse and highly restricted on the landscape: (1) near the base of the east slope of the Rocky Mountains and intermontane valleys in northcentral and central CO, eastcentral ID, southwest MT, and eastcentral and southeast WY; also downstream in western NE ; (2) the Uinta Basin and elsewhere in the upper Colorado River drainage of eastern UT; (3) near the western base of the Wasatch Mountains and elsewhere in the eastern Great Basin of western UT (historically in eastern NV); and (4) the Okanogon Highlands of WA. Alkaline wetlands, swales and old, meander channels often on the edge of the wetland or in areas that are dry by mid-summer. Habitat is limited to areas within major river drainages. In areas that are ungrazed, Spiranthes may occur among taller, relatively dense herbaceous vegetation making detection difficult. Spiranthes diluvialis can produce as many as 7300 tiny seeds per fruit. Seedlings may persist for up to 8 years as subterranean saprophytes dependent on mycorrhizal fungi (Heidel 1998). Small, inconspicuous leaf rosettes may emerge at the end of the growing season and overwinter (Arft 1995). Individual plants may not flower in consecutive years or under adverse environmental conditions and may persist below ground with their mycorrhizal symbionts (Arft 1995). The related species, S. magnicamporum may flower only once in 20 years (USFWS 1995). Life expectancy for at least one Spiranthes species has been estimated at more than 50 years (Heidel 1998). [from Fertig 2000]. Arft, A.M. 1995. Colorado Natural Areas Program report: the demography and conservation management of the rare orchid Spiranthes diluvialis (Orchidaceae). Unpublished report. University of Colorado, Boulder. 26 pp. Arft, A.M. 1995. The genetics, demography, and conservation management of the rare orchid Spiranthes diluvialis. Ph.D. dissertation. University of Colorado, Boulder. 170 pp. Arft, A.M. and T.A. Ranker. 1998. Allopolyploid origin and population genetics of the rare orchid Spiranthes diluvialis. American Journal of Botany 85(1):110-122. Heidel, B. 2000. A framework for Section 7 consultation involving Spiranthes diluvialis in Montana. Heidel, B. L. 1996. Noteworthy collections - Montana. Madrono 43(3):436-440. Heidel, B.L. 1995. Whitehall botanical site evaluation, Jefferson County, Montana. Unpublished report. Montana Natural Heritage Program. Helena, MT. 26 pp. plus appendices. Heidel, B.L. 1998. 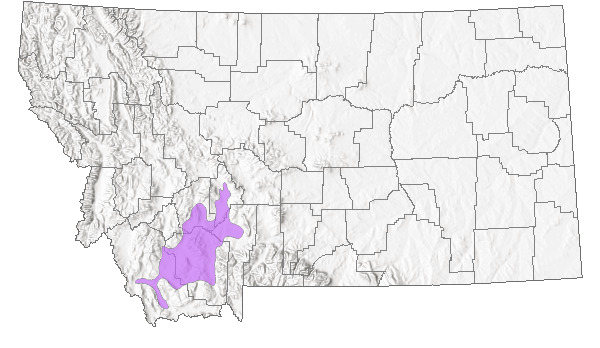 Conservation status of Spiranthes diluvialis Sheviak in Montana. Unpublished report to U.S. Fish & Wildlife Service. Montana Natural Heritage Program, Helena, Montana. 55 pp. + appendices. Moseley, R.K. 1998. Ute Ladies' tresses (Spiranthes diluvialis) in Idaho: 1997 status report. Unpublished report to the Idaho Department of Parks and Recreation, funded by the U. S. Fish and Wildlife Service. Idaho Department of Fish and Game, Idaho Conservation Data Center, Boise, Idaho 35 pp. Moseley, R.K. 1998. Ute Ladies' Tresses (Spiranthes diluvialis) in Idaho: 1998 status report. Unpublished report for the Idaho Department of Parks and Recreation and Bureau of Land Management funded by the U.S. Fish and Wildlife Service. Conservation Data Center, Idaho Department of Fish and Game, Boise, Idaho 23 pp + app. Murphy, C. 2000. Ute Ladies Tresses (Spiranthes diluvialis) in Idaho. 2000 Status Report. Prepared for Upper Snake River District, Bureau of Land Management and Targhee National Forest. Idaho Deparment of Fish and Game, Natural Resource Policy Bureau. Boise, ID. Riedel, L., S. Petersburg, and T. Naumann. 1995. Spiranthes diluvialis monitoring and habitat restoration, 1995 update, Dinosaur National Monument, National Park Service. 11 pp. Sipes, S.D. and V.J. Tepedino. 1995. Reproductive biology of the rare orchid, Spiranthes diluvialis: breeding system, pollination, and implications for conservation. Conservation Biology 9(4):929-938. Szalanski, A.L., G. Steinauer, R. Bischof, and J. Petersen. 2001. Origin and conservation genetics of the threatened Ute ladies'-tresses, Spiranthes diluvialis (orchidaceae). American Journal of Botany 88(1):177-180. U.S. Fish and Wildlife Service. 1992. Endangered and threatened wildlife and plants; final rule to list the plant Spiranthes diluvialis (Ute ladies' tresses) as a threatened species. Federal Register 57(12):2048-2054. U.S. Fish and Wildlife Service. 1995. Ute ladies' tresses (Spiranthes diluvialis) draft recovery plan. U.S. Fish and Wildlife Service, Denver, Colorado. 46 pp. U.S. Fish and Wildlife Service. 1995. 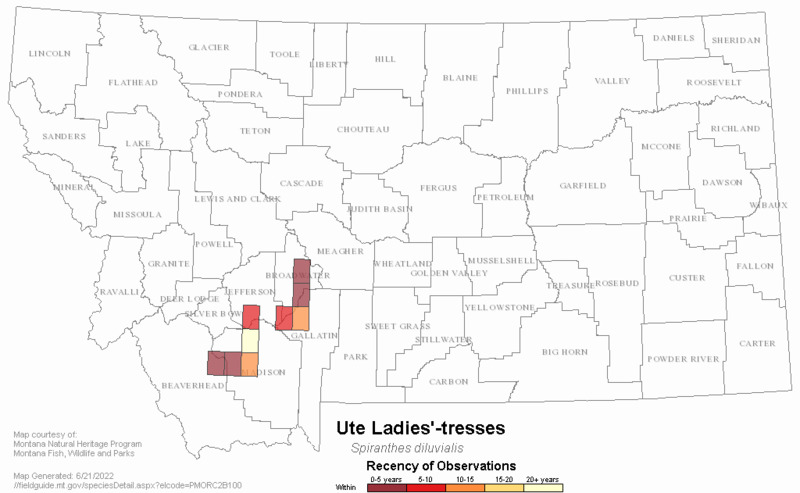 Ute ladiesí-tresses (Spiranthes diluvialis) recovery plan ñ agency review draft. 46 pp. 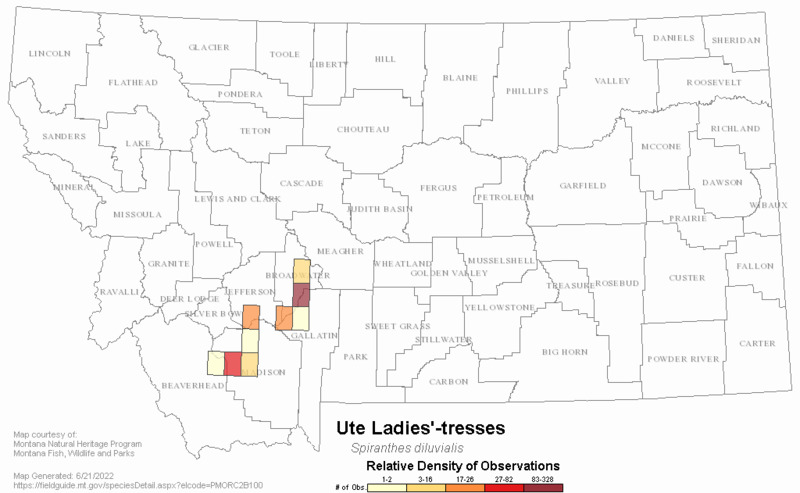 Web Search Engines for Articles on "Ute ladies'-tresses"